For anyone who cooks and likes zesty food,garlic is a year-round essential. Doing without just isn’t an option. Happily,garlic is absurdly easy to grow in Zone 4,so my goal is to never buy garlic,especially any shipped in from the West Coast where the majority of commercial garlic is grown. For the most part,my goal of year-round garlic is met,but at this time of year,during the gap between the last bulbs from the previous year and this year’s new crop,it might seem that buying garlic is the only option. Turns out there are a lots of home grown options —as long as you’re willing to explore beyond the familiar,papery garlic bulbs that we all know so well. Let’s start with last year’s crop. 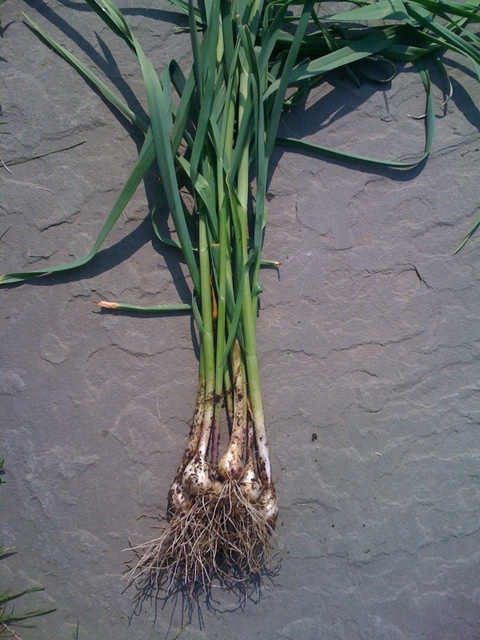 A single,fall-planted garlic clove transforms into a fully formed bulb with multiple cloves by July. With so little effort involved,it’s a great deal! Harvested and dried for storage,then kept in a cool,light,well-ventilated space,garlic bulbs last in good condition until sometime in winter when they start to form green sprouts that begin feeding off the stored energy in the clove. Just before the sprouts form,we’ve found it pays to process and freeze all the remaining bulbs by trimming and peeling the cloves and popping them raw into a container for freezing. (Good to do while watching the tube or cranking up the tunes.) Frozen garlic can be used right out of the freezer and tastes just as pungent as when fresh. A quick rinse to remove any ice crystals and the cloves are ready to crush or chop. Easy and very handy to have around. Our frozen garlic ran out out in April this year. Luckily we’d made it to wild leek (ramp) season when the slightly garlicky taste of ramps and the imperative to eat freshly harvested,wild green things,held us over for awhile. Then it was on to the garlic chives. These are perennial plants similar in habit to common chives but with flat,strap-like leaves that offer a mild but distinctly garlicky flavor. Like regular chives,garlic chives are most tender and flavorful in spring and fall when the weather is cool. The garlic (or Chinese) chives have the added benefit of throwing up multiple clusters of tiny,white,star-like flowers in late summer and fall. These pretty little flowers can be used as garlic taste-bombs,sprinkled on top of dishes. The plants tend to be neater and better-behaved than their common cousin,so I often refrain from dead-heading and allow garlic chives to self-seed among the other perennials or tuck the plants into the corners of my vegetable beds. The leaves can be chopped or clipped with scissors and added directly to salads or used as garnish. When cooked,they should be added at the end to retain maximum flavor. At this point June,it’s the season of ”garlic scallions,”immature bulbs that haven’t formed into cloves yet. These can be used just like scallions including much of the stalk. I can’t bear to use up any plants from my main garlic crop this way,so am always delighted to see isolated clumps of serendipitous shoots arising from last year’s garlic beds. The shoots come from whole bulbs left over from the previous year’s planting that I somehow missed when harvesting in the summer. They simply stayed in the ground and sprouted in the spring. Often they are from the less-robust bulbs that would have been under-sized anyway so these volunteers are perfect for use as garlic scallions. I’m thinking about intentionally planting a few of my smaller bulbs this fall to ensure a steady supply of garlic scallions next spring and in early summer. Garlic scapes left to curl,just for fun. Next in line are the garlic scapes, just now starting to form on my early crop of stiff-neck garlic plants. These curling flower stalks should be removed,not only to capture the good eating,but also to signal to the plant that it needs put its remaining energy into the bulb. The scape ought to be picked before it starts to curl to avoid toughness but I tend to let some go a bit longer just to admire the scapes’supremely smooth and elegant spirals. Scapes have a mild flavor,enhanced by quick steaming or sauteing. A newly discovered but delicious use is pesto made from garlic scapes. 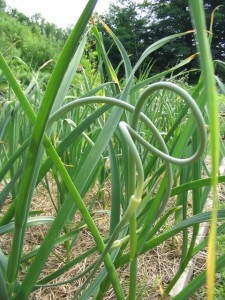 Scapes will only form on stiff-neck garlic varieties. Once the fall-planted garlic bulbs finally reach full size,it’s time to pick some juicy,crisp,young garlic. When garlic is harvested early,the skins are surprisingly moist and flexible,and the water-engorged cloves slice cleanly and crush with a satisfying crack. We like to cut and saute them in generous “garlic-as-vegetable”slices. If picked too early when the divisions between the cloves first form,the cloves will be undersized and mostly made up of the thick layers of skin. It’s interesting to see and feel their unusual texture at this stage but not much use in the kitchen. A little trial and error is required ascertain the right time to pull up the bulbs for young garlic. For young garlic,I grow a 2′x 3′patch of garlic in my hoop house,planted in October specifically for early harvest in June. This gives me decent-sized young garlic bulbs a little earlier than the main crop and I can harvest early without feeling like I’m robbing from the all-important winter storage crop. In another month,the skins of the garlic plants will become dry and papery and the lower leaves of the plant will begin to yellow and die. When the bottom 3-4 leaves lose their green color,its time for the main harvest. But until then,let’s savor the many variations on a garlic theme available in the early summer garden.